Who doesn’t love to have fun time at the beach during summers? But unfortunately, even if you have slathered a lot of sun screen, the UV rays can sneak through and you may end being sunburned. Though occasional sun exposure is a good thing to prevent vitamin D deficiency and improves overall health, too much of it can lead to sunburn. Sunburn is caused when sun’s UV rays damage the skin cells and tissues. In response to this situation, our body increases melamine production to prevent further damage, this is why you experience tan or discoloration. Redness, itching, peeling and burning sensation are experienced when our body is trying to repair the damaged skin cells. The severity of the sun damage depends on the many factors like the intensity of the sun, the duration of exposure to sunlight and skin tone. In addition to pain and inflammation, sunburn can also lead to fever, vomiting, acute weakness and chills. 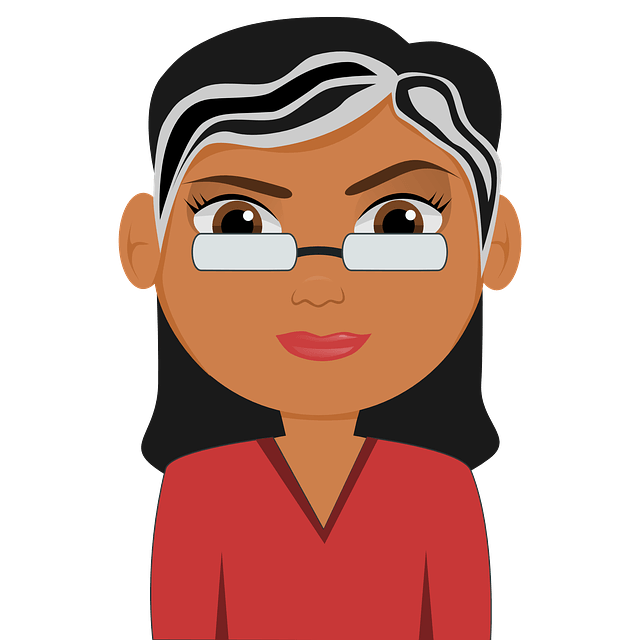 If you are experiencing any one of them, then it is better to get a medical help. However, in normal cases (excluding the above mentioned severe cases) sunburn can be treated at home with natural ingredients like apple cider vinegar, milk or tea. They are capable of providing quick relief from the pain, irritation, and inflammation caused by sunburn. In this article, let’s talk about the different ways in which apple cider vinegar can be used to have a soothing effect on the sunburned skin. What Makes Apple Cider Vinegar Effective for Sunburn? Apple cider vinegar contains malic acid, an alpha-hydroxy acid that speeds up the healing process of the sunburned skin by stimulating blood circulation. The acetic acid content of apple cider vinegar acts as an anti-inflammatory agent to provide relief from swelling, redness, and pain. Apple cider vinegar helps to maintain the natural pH levels of the skin which minimizes the blistering and peeling. Apple cider vinegar is naturally anti-fungal, anti-microbial and antiseptic in nature. It helps to prevent infections in the skin tissues from damaged sunburned skin. It is a good source of vitamins and minerals that help replenish the nutrients and moisture in the sunburned skin, leading to faster healing. 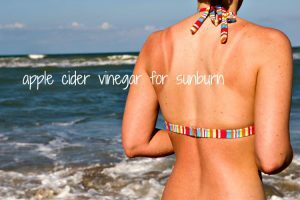 Diluted apple cider vinegar can be used in a number of ways on sunburned skin to speed up the healing process and provides relief from painful symptoms of sunburn. We have mentioned them below for your convenience. The simplest way of getting relief from the painful symptoms of sunburned skin is to use diluted apple cider vinegar directly on the skin. Direct application: Dilute a few teaspoons of apple cider vinegar with an equal quantity of cool water in a bowl. Dip a washcloth/cotton ball/soft cotton towel into it, wring it out and gently dab on the sunburned areas of the skin. Repeat multiple times a day. Spray: Mix equal quantities of apple cider vinegar and cool water in a spray bottle. Spray on sunburned skin multiple times a day. Bath: Add 1-2 cups of apple cider vinegar to 1 bucket of cool water/tub before bathing. Soak in affected areas of the skin daily for about 30 minutes for a soothing effect on the sunburned skin. Note: If the lingering smell of apple cider vinegar on your body seems unpleasant, have a cool shower after an hour or so without the vinegar. Honey is a natural anti-inflammatory agent which decreases swelling and soothes sunburned skin. It also contains a number of beneficial enzymes and proteins that promote the healing process. Mix 2 tablespoons each of apple cider vinegar and honey in a bowl. Apply this mixture on patches of sunburned skin. Leave it on until the application dries up completely. Gently wash off the application with cool water. Repeat the method once daily. Coconut oil is a good source of beneficial fatty acids like capric and lauric acids which make it a potent anti-microbial agent to prevent infections. The saturated fats in it help to retain the moisture within affected skin, resulting in a faster healing process. Also, the vitamin E component of coconut oil helps in repairing of damaged and sunburned skin tissues. Dip a washcloth in a cool diluted solution of apple cider vinegar. Dab it on the sunburned areas of the skin. Allow it to air dry for 2-3 minutes. Rub some coconut oil in gentle circular motions on the affected skin. Leave on overnight and wash off with cool water in the morning. Note: you can also add 2 drops of lavender and 1 drop peppermint essential oil into coconut oil before massaging it on the affected areas. Coconut oil may result in stains so make sure to wear old clothes while trying this process. Olive oil is rich in polyphenol compounds that act as antioxidants to repair the damaged tissues of the sunburned skin. In a bowl, mix equal quantities of apple cider vinegar and olive oil. Wash off gently with cool water. Mint is a natural cooling agent for sunburned skin. It is a rich source of anti-oxidants that help in healing the burned and inflamed skin. Plantain is anti-microbial, anti-inflammatory and anti-toxic in nature. This helps to relieve the pain, inflammation, itching, and burning associated with sunburn. Lavender has a powerful antimicrobial and antiseptic action on the sunburned skin, preventing it from further infections and speeding up the healing process. Boil 1 cup of water and add 2 tablespoons of any herb of your choice (like dried mint or plantain leaf or lavender flowers). Once it attains room temperature, use a strainer to separate the herbs from the solution. Add an equal volume of apple cider vinegar to the herb solution and stir well. Spray on sunburned patches of the skin multiple times a day. Note: You can also use a cotton ball to dab the solution onto affected sunburned skin. The antiseptic and alkaline nature of baking soda has a cooling effect on the sunburned skin. It helps in healing damaged skin and provides relief from itching and inflammation. Cornstarch is another alternative that can be used instead of baking soda in the following remedies for sunburned skin. Take 2 teaspoons of apple cider vinegar, 1 tablespoon of baking soda and 3-4 drops of any essential oil of your choice (optional) in a bowl. Stir well and apply on affected areas of the skin. Allow it to air dry for 5-10 minutes. Note: Essential oils you can use in this method are peppermint oil, tea tree oil, and lavender oil. Peppermint oil is a natural pain-killer that relieves the burning sensation on affected areas of the skin. Tea tree oil has a soothing effect on sunburned skin and reduces the peeling and blisters associated with it. Lavender oil is a natural anti-microbial that reduces the redness and stinging sensation of sunburned skin. Oats are a rich source of anti-oxidants and have an anti-inflammatory effect on sunburned skin. It soothes irritated, itchy and swollen skin. In a bucket or a tub, add 1-2 cups of apple cider vinegar, 1 cup of oats and ½ cup of baking soda. Soak the sunburned areas of the skin for about 30 minutes. The starch content of potatoes is known to have a cooling effect on sunburned skin. It also helps to keep skin adequately hydrated and relieves the painful symptoms of sunburn. Mix 1 teaspoon of diluted apple cider vinegar with 1 tablespoon each of baking soda and potato juice in a bowl. Apply on sunburned patches of the skin. Wash off gently with cool water once the application dries up. Alternative Method: Combine juice of 1 potato and 2 cups of apple cider vinegar. Adding this solution to your bathing water can provide relief from the pain and swelling associated with sunburn. Vitamin E oil neutralizes the damaging effect of free radicals on sunburned skin and helps in rapid healing of the damaged skin tissues. Aloe vera is a good source of glycoproteins that are anti-inflammatory in nature and reduce swelling on sunburned skin. The lidocaine constituent of aloe vera works to relieve the painful symptoms of sunburn. The hormones auxins and gibberellins in aloe vera help form a protective hydrating layer over sunburned skin, speeding up the healing process. In a bowl, add 1 tablespoon of apple cider vinegar, the oil from 2 vitamin E tablets, 1 teaspoon of lavender oil and ½ a cup of aloe vera gel. Mix thoroughly and apply gently on sunburned areas of the skin. Note: An alternative remedy would be to mix 1 part of apple cider vinegar with 2 parts of cool water in a spray bottle. Add 2 tablespoons of aloe vera gel to it and spray or dab on sunburned skin for relief. Adding ¼ cup of rosewater to the same remedy has an anti-inflammatory and soothing effect on sunburned skin. Carry out a simple patch test with a few drops of apple cider vinegar on the inner arm before using it as a remedy for sunburned skin. Always ensure that the apple cider vinegar is diluted with water in a 1:1 ratio. Natural apple cider vinegar is highly concentrated and can cause a burning sensation on the skin. If available, opt for raw and unpasteurized wood-aged organic apple cider vinegar instead of the chemically-aged one. If you have sunburned patches of skin on your face, apply diluted apple cider vinegar using a cotton ball instead of spraying it. Its acidic nature can cause discomfort, irritation and a burning sensation if it gets into the eyes. Make sure you keep the apple cider vinegar spray out of reach of children. When drying sunburned skin after a bath or washing off an application, always dab with a soft cotton towel. Do not rub otherwise the inflammation and irritation can increase. Using apple cider vinegar remedies on sunburned skin do not guarantee an overnight or instant cure. The burns may still take a few days to heal but you will find relief from painful symptoms of sunburned skin. Avoid using apple cider vinegar remedies on open wounds or burst blisters. It can lead to further inflammation and skin irritation. In case of excessive dryness on sunburned patches after washing off an application, apply a mild water-based aloe vera moisturizer to soothe the skin. Always use a sunscreen (SPF 15 or higher) and wear light colored clothes before going out into the sun. Light colors do not absorb much heat from the sun and keep the skin safe. This prevents the occurrence of a secondary skin infection on sunburned skin. Opt for a mild anti-bacterial soap for bathing if you have sunburn. Avoid harsh soaps or soaking sunburned skin in a bubble bath as it can further irritate the inflamed skin. Avoid going out in the sun between 10 am and 4 pm. This is when the harmful ultraviolet rays are the most dangerous for the skin. Keep your body and skin adequately hydrated by drinking at least 8-10 glasses of water a day. Do not scratch or burst any blister on sunburned skin. This will delay the healing process and make the skin raw and inflamed further. Certain medications tend to make your skin ultra-sensitive to the sun. So, it is better consult your doctor if you have a sunburn and are on certain medication. In case your skin gets excessively sunburned or you experience blisters which do not heal, chills or accompanying fever, it is recommended to consult a doctor immediately. Remember – the best natural remedy for sunburn is prevention from excessive exposure to the sun. But in case you do get affected, these simple and easy-to-use apple cider vinegar remedies can help you get relief. Do let us know more about your experiences and suggestions in the comments section below. My face got burnt using too much of garlic paste. The wounds have healed but left a dark scar on my face. Is it oky to apply ACV on it to lighten my scar? Will it burn more?